Extra large jewellery box. Beautiful quality with luxury velvet lined drawers. Glossy black piano finish on the wood which gives it a high end finish. No internal mirror but box is so large would not be able to carry often anyway, Need large dresser for this jewellery case. Beautiful quality for an excellent price. 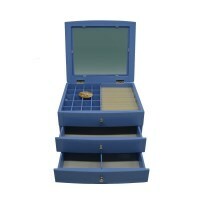 It is a large jewellery box with plenty of storage. Internal lining is also a nice quality velvet. It is a touch of luxury with the large internal mirror. It's gorgeous. A gift for somebody special.